Opinion: Haiti's Troubles Must Not Be Forgotten Haitians are angry about rising costs, austerity measures and corruption. Haiti's democracy needs improvement, argue researchers Athena Kolbe and Robert Muggah. A tire placed by a small group of demonstrators burns on a street in the Pétion-Ville area of the Haitan capital Port-au-Prince, on Feb. 17. Athena Kolbe is an assistant professor of social work at the University of North Carolina, Wilmington. Robert Muggah is the co-founder of the Igarapé Institute in Brazil, and the SecDev Group in Canada. The stench of burning tires is hard to escape. 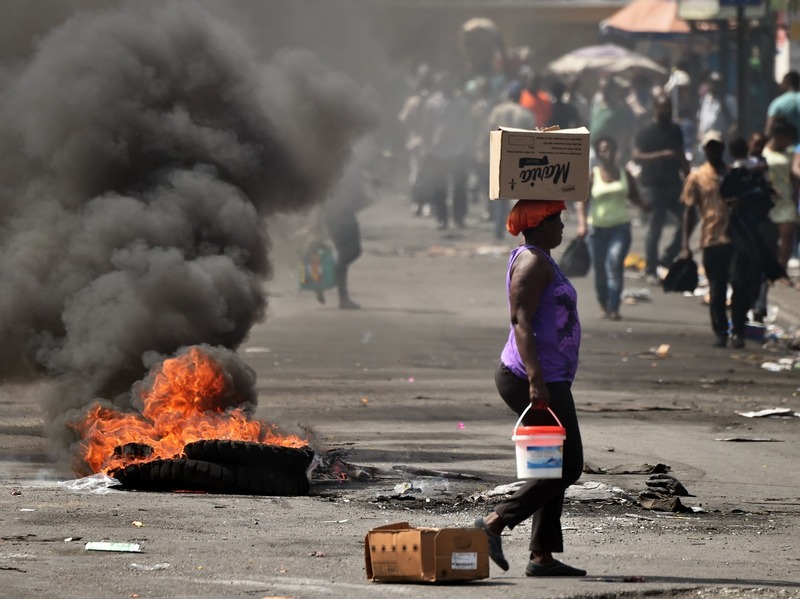 Haiti's capital, Port-au-Prince, is again littered with smoldering barricades. Towns across the country are in lockdown. Over a million people took to the streets this month in protest, effectively shutting the nation of nearly 11 million people down. Demonstrations turned violent amid accusations that Haitian officials pillaged a multibillion-dollar Petrocaribe development fund subsidized by Venezuela. The opposition is calling for President Jovenel Moise to resign. But Moise is defiant, insisting that he "will not leave the country in the hands of armed gangs and drug traffickers." Haiti has been seized by demonstrations over the past year. Grievances range from the skyrocketing costs of food and gas to crippling austerity and elite graft and impunity. Oddly, the Haitian administration and the foreign donor governments funding it have seemed stunned with every new protest. The Petrocaribe fund scandal, however, is pushing the fragile country to the edge. Last year, deep-seated anger escalated into stone-throwing encounters between protesters and police officers. The rage erupted online in August, when Haitian-Canadian videographer Gilbert Mirambeau posted a tweet in which he appears blindfolded and asks the simple question in Haitian Creole: "Kot Kòb Petwo Karibe a ???" — where is the Petrocaribe money? Petrocaribe was launched over a decade ago as a way for Caribbean and Central American countries to buy discounted oil and receive credit financing from Venezuela. Funding from the program was expected to pay for education, health, agriculture and infrastructure projects. The scale of alleged theft in Haiti is breathtaking. A 2017 Haitian Senate report said that, between 2008 and 2016, money generated by the oil-purchasing program was misused, misappropriated and embezzled by dozens of government officials and heads of private firms. In January, an auditor's report concluded that almost $2 billion was diverted from the fund. A company tied to President Moise was accused of receiving irregular payments before he took office. Moise and the other current and former officials vehemently deny the accusations. The initial report led Moise to fire his cabinet chief and 15 government advisers, but he did not require them to admit guilt. Under pressure from the opposition, the government said last month it would deepen investigations into alleged corruption. But Haitians are outraged by the slow pace of the investigations and lack of arrests of senior politicians and business people. The scandal is all the more jarring given Haiti's sharp economic and social disparities. Close to 60 percent of Haitians live below the poverty line of $2.41 a day. Two years ago, a bag of basic staples such as rice, beans, cooking oil and vegetables could be purchased for around $10. According to a monitoring system we set up back in 2004, the same basket of goods today is $19.60, almost double the price. The costs of everything from water and kerosene to transportation and school fees are soaring. Haiti's already unreliable electrical grid is falling apart: areas that once received a few hours of electricity a day are now going days or weeks without access to energy. Across the country shops and banks are closing. Haiti's historical struggle for democracy should not be forgotten in today's crisis. The country stunned the world when it became the first independent black republic in 1804 after expelling France and abolishing slavery. But Haiti was alternately shunned, raided and occupied by Western powers until the mid-20th century. The nation, which shares the island of Hispaniola with the Dominican Republic, endured brutal dictatorships and coups before pulling off free and fair elections in 1990, though their first elected leader would also be deposed twice. Although Haiti has survived devastating disasters, including an earthquake in 2010 that claimed at least 158,000 lives, and a cholera epidemic started by United Nations peacekeepers, the country has struggled to establish strong democratic institutions. In 2017, Haiti was considered stable enough for the U.N. peacekeeping mission to end its 13-year tenure. It left behind a handful of advisers to train the national police and strengthen the criminal justice system. Despite several major setbacks, the mission is credited with helping restore a modicum of democratic rule. Yet the current president is viewed by most ordinary Haitians as an illegitimate leader who stole the election from his opponents. This was confirmed during surveys of more than 1,700 Haitians we conducted for the Igarapé Institute, a Brazilian think tank, during the 2015 and 2016 presidential elections which pitted Moise, a businessman, against Jude Célestin, a political moderate who was popular across Haiti's divided classes. Moise was declared the winner in November 2016 and assumed the presidency in February 2017. We found that faith in the voting system and democracy overall was adversely affected by voter intimidation and fraud. We also witnessed widespread voting irregularities firsthand, including ballot stuffing. President Moise's victory was confounding for several reasons. Back in 2015, just before the first presidential election, we asked respondents which of the two candidates they preferred: 91 percent selected Célestin. At the time, just 3 percent of the adults we randomly surveyed said they planned to vote. Instead, many said the entire process was bankrupt and that voting was neither free nor fair. Roughly 19 percent of the respondents said there was "no point" in voting, 15 percent feared violence at the polls, and 13 percent said they wouldn't vote because "politicians don't care about people like me." In the end, few Haitians turned up to vote in 2015 — just 18 percent of eligible voters, according to election officials. After the 2015 vote was nullified due to accusations of fraud, a second election was held in 2016, and just 21 percent of voters showed up. In the end, the provisional electoral council determined that over 55 percent chose Moise and only 19 percent selected Célestin. In the wake of the second election, voters were significantly less likely to agree with the statement that "in a democracy voting is important because it determines who leads the country." It is possible to improve the resilience of Haiti's democracy. This will require strengthening Haitian institutions and ensuring that international aid helps, and does not hinder, the country's democratic institutions. At a minimum, a priority must be put on expanding the number of women running for office, on assisting local civic groups — especially youth organizations — that work to promote peaceful electoral processes and on strengthening independent vote monitoring. A goal must also be to empower accountable legislatures, judiciaries and civil rights groups. They have the potential to exert a powerful check on executive power and corrupt businesses, and wrest back control from the elite. The Petrocaribe imbroglio ignited a popular movement demanding change — and it may signal a turning point for Haiti. For years, democracy in the country has been tenuous, with rampant corruption and economic barriers to participation largely to blame. Most Haitians are disillusioned and don't believe their leaders are truly doing what is best for citizens. Until they do, streets will keep burning. The country's protests will only end after all Haitians are confident that their voices really count. The real question is whether the country's elites and donor community are prepared to let that happen.